Being a strong softball pitcher is just one of Sydney Hopper’s strengths. She will attend Wellesley College next year. In addition to her softball prowess, Hopper has a 3.99 GPA, mentors special-needs children and was Homecoming queen. RENTON – Sydney Hopper has enjoyed heroic moments in softball. Winning hits at the plate, game-saving strikeouts in the pitching circle. She is a key reason Liberty High School of Renton started the season 7-0 before recent back-to-back losses to Lake Washington. But it’s the way Hopper conducts herself off the field that causes others to look up to her. She believes in giving back. So, in addition to playing softball and carrying a rigorous academic schedule (with a 3.99 GPA), the 18-year-old senior volunteers to help others in a variety of programs, including two dealing with special needs youth – Camp Casey and Athletes for Kids. Freshman Jessie Tappan, who has ADHD and is developmentally delayed, is in her second year as Hopper’s “buddy” through Athletes for Kids, and the two share a tight bond. Tappan’s smile in a photo with Hopper taken before a Liberty football game last fall tells you how much her mentor means to her. And Hopper’s smile is even bigger. Hopper considers herself fortunate to have many role models in her life, so this is a way to pay it forward. “I’ve had a lot of people in my life that have really helped me out, that have been mentors for me,” she said. “I really do think I have the best parents in the world. They have supported everything I’ve done, and coaches I’ve had, teachers, friends – I’ve just had so many supportive people around me, and I’m really grateful for that. So, I wanted to be that for other people. Hopper, the youngest of two children, began volunteering as early as sixth grade. And to be her coach, according to Jon Kinsley, a longtime assistant who took over the softball program this season as the Patriots faced their third head coach in four years. Hopper, a three-year captain who also ran cross country, plays clarinet in the school band (and guitar on her own) and is past president of Liberty’s honor society. As a Relay for Life captain earlier this school year, she raised nearly $2,000 on her own for the American Cancer Society. She helped organize the offseason softball workouts and will run Liberty’s kids’ camp. Oh, she was Liberty’s Homecoming queen as well. LW coach Traci Tawney said Hopper is always complimentary to opposing players, win or lose. “She just really seems to enjoy the game,” Tawney said. And she’s good at it, too. At 7-2, Hopper has 64 strikeouts in 46 innings with a 2.50 ERA while batting .464. 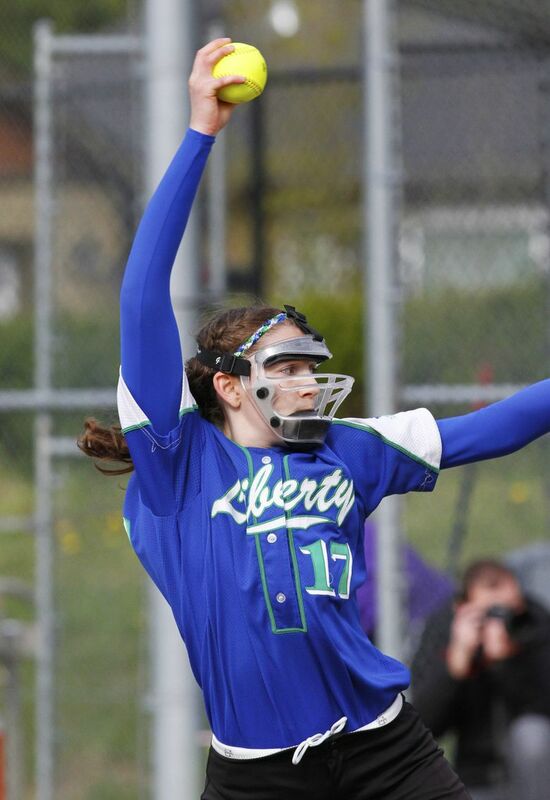 She plans to play at Wellesley College in Massachusetts, but first hopes to lead Liberty back to the 3A state softball tournament and improve on last year’s 0-2 finish. And the perfect leader to help them reach it.